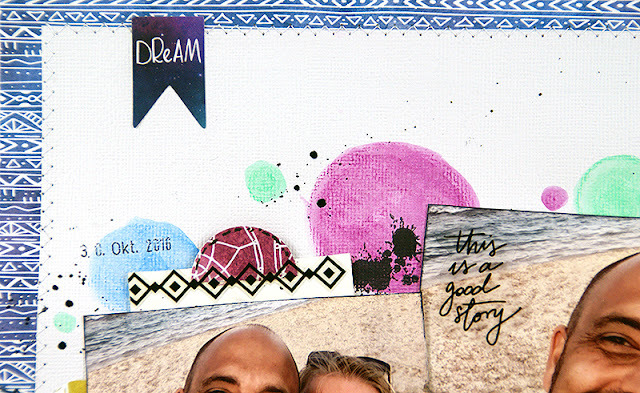 I chose a photo of me and my husband for this page and the story behind this layout is our anniversary. It is a happy page and all about feelings, so I added a long journaling, but hid it behind the smaller photo, because it is quite personal. 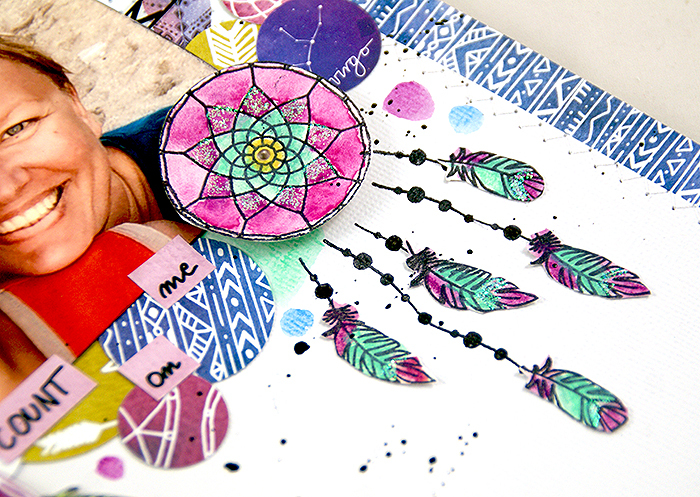 As a focal point I created three dreamcatchers with the Moonchild collection stamps and papers and watersoluble wax crayons. I then went along with the circle theme and added a border of circle punched papers underneath the photos and drew some crayon circles here and there behind the photos in matching colours. 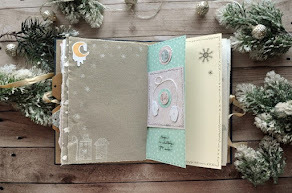 I´ve used a sewing machine to attach the cardstock to the patterned blue toned paper. It adds a fun detail and a finished feel to the page. 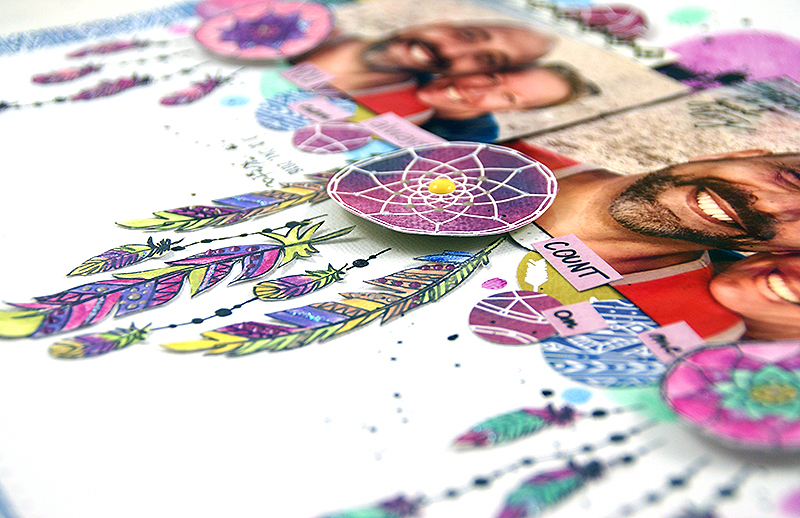 There are lots of little bits and pieces that add to detail to the layout, like the in pieces cut stickers sentiments, the black ink splatters and the stamped "splatters" peeking thru behind the photos here and there. 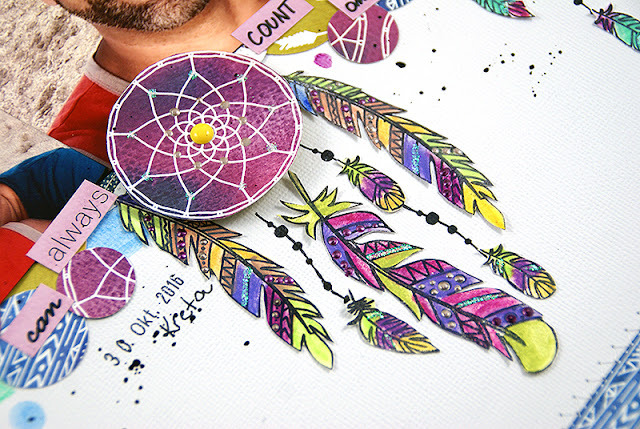 In the end I added some details to the colored, fussy cut and stamped dreamcatchers with liquid pearls and glitter glue and even a single enamel dot in the very middle. I am also trying to document my layouts with a date and a place nowadays, to give me an idea later, where and when that particular picture was taken. See, the problem is, you think you will remember, but in a few years time, you will have forgotten. So better put those details down while creating. I´ll leave you with the start-to-finish video today (it´s quite a long one this time) and will be seeing you in a few weeks time again! I´ve also again added a link list of the products I´ve used for this layout and tried to replace product that was older/not available anymore with a similar product that would work as well.